At the foot of Summit County’s highest peak you’ll find McDill Placer. Quandary is on the southern side of Summit County, the last mountain before Hoosier Ridge, which separates Park and Summit counties, and is the highest peak in on the Summit side. Getting out of town to the south and over the pass into South Park is easy, so this is great property for people living in Colorado Springs or elsewhere in southern Colorado. It’s south of the incorporated town of Blue River so it is governors only by the rules of the county. McDill is a neighborhood where it's possible to find affordable homes while still getting a little land. Homesites, here, are generally 1/2 acres and can offer great views of the Ten Mile Range and just about all can see Baldy Mountain and Boreas to the east. Ready access to hiking trails and cross country skiing, these lots offer a lot of privacy and quiet. The layout of the neighborhood is traditional, and home to many local, full-time residents, so if you need to borrow a cup of sugar, you'll probably find it within walking distance. Water is supplied by individual wells, with good water quality, if quite deep. Some of the olders homes may have a septic system, but a modern local sanitation district is in use for most of the main neighborhood. East McDill is different, but does have access to natual gas, which is not the norm in the neighborhood. McCullough Gulch crossing on the Wheeler Trail. Walk up Summit County’s only 14er from your home in McDill Placer, or walk up Blue Lakes Road to, yes, the Blue Lakes. 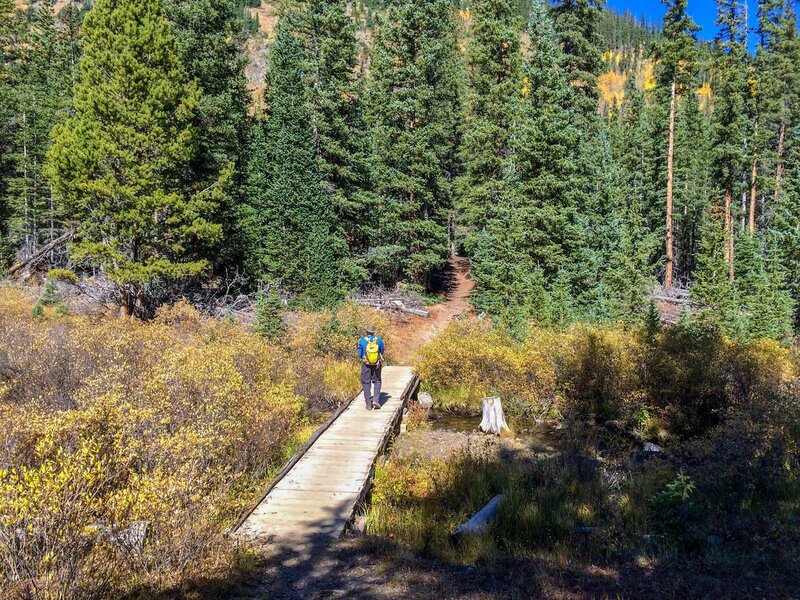 Take a trail around the base of Quandary, and find McGulloch Gulch and a nice stream-side hiking trail that leads down to Highway 9, or up the gulch and intersects with the Wheeler Trail - a well-establish trail, about a days walk, into Breckenridge. The Blue River runs along the highway at the entrance to the neighborhood and is well known for great fishing. What most local know as McDill Placer is west of Highway 9, but two very large lots, one developed can be found on the other side of the highway. This area is sometimes called Mountain Kingdom, each lot being larger than 10 acres and thus pretty regal. Technically, the county calls this McDill Placer East. Acreage: .45 to 10 acres - nearly all lots are close to 1/2 acre, with a couple of 3/4 acre exceptions and the large McDill East lots at 10+ acres. Drive south from central Breckenridge for about 7.5 miles, taking one noticable switchback, and then a long straighaway, you'll come to an open valley at the base of Quandary Mountain and Blue Lakes Road - a sign pointing out to Quandary Trailhead will help. Take a right on Blue Lakes Road, and you'll find what you're looking for; it's a small and obvious subdivision. Most McDill Placer homes will be found along this road or the interior McDill Placer Road, unless it's in McDill Placer East, in which case, the turn is to the right on Monte Cristo Rd.